Stamos was born in Cypress, California, to William John Stamos (a restaurant owner of Greek descent) and Loretta Phillips (an Irish immigrant); his paternal grandfather, Hermes Stamotopoulos, shortened the surname to “Stamos” upon emigrating from Greece to the USA. John has two sisters, Janeen and Alaina (both of whom are school teachers). He was raised in the Disciples of Christ church, which he still attends. Stamos started his acting career with a role on the television show General Hospital as Blackie Parrish. Later he joined Full House as Adam Cochran, but he then changed the first name to Jesse before filming the premiere. During the second season he then changed his character’s last name to Katsopolis to highlight his Greek heritage, which Stamos is very proud of. 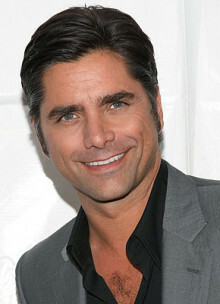 Stamos also played the role of Jesse’s cousin Stavros in episode 18 of season 7. After the eighth season of Full House, ABC decided to drop the show from their lineup. The ninth season was to be shown on the WB Network. Because of this, Stamos announced his departure from the show. Because his influence on the show was critical, the eighth season on ABC ended up being the last one. He has subsequently appeared in numerous made-for-television films, stage productions and commercials (including advertisements for the long-distance phone call carrier 10-10-987 in 2004). Stamos also has an active music career, having occasionally toured as a drummer with The Beach Boys, and having appeared on Broadway as the Master of Ceremonies in Cabaret. Inbetween touring with The Beach Boys and having minor parts in off-Broadway plays, John Stamos also collected kick-back checks from numerous Full House re-run shows; notably between 1995-2005, anything that is still running on ABC FAMILY on cable television. He also, along with kick-back checks from Full House, collected numerous royalties from the commercial ads of 10-10-987. He recently starred in the television series, Jake in Progress, which debuted in 2005 and now it is probably going to be cancelled because John is joining the cast of ER on it’s 13th season. In 2006, it was announced he’d be joining the cast of ER. The producers originally wanted him earlier, but it was postponed when ABC renewed Jake in Progress. Stamos married supermodel/actress Rebecca Romijn on September 19, 1998. The couple separated in late 2004 and were officially divorced in March 2005. Stamos has also dated numerous celebrities, including former Full House costar Lori Loughlin (who also starred in Summerland), Chelsea Noble, Demi Moore, Denise Richards, and current American Idol judge and former pop star Paula Abdul. Stamos is a huge fan of Disneyland and holds a lifetime pass to the park. He once paid $30,000 for an entrance sign to the park. Stamos was a guest on the Andy Milonakis Show, where he was seemingly Andy’s “pet”, and ended up getting stuck in a tree. A fireman rescued Stamos, but he was shot by a farmer after it was discovered that he had rabies. John Stamos was the subject of a portion of Nick Swardson’s Comedy Central Presents stand-up special where Swardson jokes about paying Stamos to come to his funeral and cry to throw off his family. Stamos is the best friend of South Park co-creator Matt Stone. Stone wrote in a bit part for Stamos’ older brother Richard Stamos in the episode “Big Gay Al’s Big Gay Boat Ride”. Do you want to hire John Stamos? Directly request a quote. In 48 hours we can send you the availability of John Stamos If you would like to book John Stamos, Entertainment Booking Agency is the right place. We will offer you the best price and contact the management or we directly contact John Stamos. For corporate appearances or speaking engagements you can contact our agents and the will help you true the process. Tags: hire John Stamos, John Stamos booking, book John Stamos, John Stamos appearances, find more information on booking John Stamos for appearances, John Stamos speaking engagements, John Stamos endorsements/spokesperson, John Stamos appearance fees, John Stamos booking agency contact info, biography of John Stamos, Contact an artist booking talent agent find a speakers bureau that can book John Stamos, speaker booking agency for John Stamos, John Stamos booking agency, John Stamos booking for corporate event. EBA is one of the biggest entertainment booking agencies in the World. We book hundreds of celebrities, artist, athletes and speakers in a year. Important to know is that we are not claiming to be the management of John Stamos. We are not the official agent for John Stamos. Companies from around the globe book these artists and speakers true our company be course we have one of the biggest networks and we always have direct contact with the artist or the management. We help you to find the right celebrities for your corporate of private events. Please contact one of our agents to get free advice and we will help to get the world-famous artist on your party.